Alessandro Cortini (born May 24, 1976, in Bologna, Italy) was the keyboardist during live performances by Nine Inch Nails from 2005 through 2008. He also occasionally plays guitar, for example, on "Getting Smaller," "Mr. Self Destruct," and "Echoplex." Alessandro was once again a touring member of Nine Inch Nails on their 2013-2014 tour and also served as an opening act for the NIN 2014 Japan Tour. 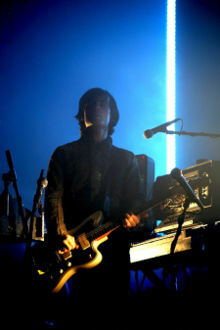 He is also part of the current How To Destroy Angels live lineup, contributing bass, synthesizers and vocals. Cortini was born in the Italian city of Bologna and raised in Forlì. Sometime around 1998, Cortini moved to the United States to study guitar at the Musicians Institute, where he met Swedish guitarist Pelle Hillström. After graduating he began focusing on keyboards and synths. While briefly teaching at the Musicians Institute, he saw an ad for open auditions for Nine Inch Nails; after impressing Trent Reznor in his audition, he was brought on board to form the live band for the 2005 Live: With Teeth tour and has been a member of the band ever since. On December 13th, 2008, Cortini posted a blog on Modwheelmood's MySpace account stating that he is leaving the band and that the other members had known of his decision for some time. Cortini has shared songwriting credits with Reznor for several songs on Ghosts I-IV and "The Eater Of Dreams". He appears in the NIN music videos for "The Hand That Feeds" and "Survivalism". In 2017, he appeared as part of Nine Inch Nails (in this case consisting of Trent Reznor, Robin Finck, Mariqueen Maandig, Atticus Ross, Cortini and Joey Castillo of Queens Of The Stone Age) in an episode of the reboot of Twin Peaks. Cortini is also the frontman of Los Angeles-area band modwheelmood, which he leads with Hillstrom. The band is signed to fellow NIN bandmate Aaron North and Travis Keller's record label, Buddyhead. Prior to forming modwheelmood, Cortini acted as touring guitarist for The Mayfield Four. In 2010, Alessandro started his solo-project called SONOIO (from "sono io", which is the Italian for "it's me"). Its first album, Blue, was released in 2010 and was followed by a remix album. The second album, Red, was released in 2011 and again followed by a remix album. Alessandro composed music using a Buchla Music Easel in late 2012 and released the material through Important Records in 2013. Forse, meaning "maybe" In Italian, is a series of three double LP releases followed by a CD box set containing all three volumes. Cortini currently resides in the Los Angeles area with his dog and three cats. This page was last modified on 6 July 2018, at 22:51. This page has been accessed 136,006 times.